For many years I have walked to the shops with my trolley and so avoided using a car to do my shopping. However that has meant shopping at Woolworths. I used my Ethical Supermarket Shopping Guide and bought as little as possible there however I was still going through that turnstyle. And then Janet told us at our Community Group meeting about BananaBlue. 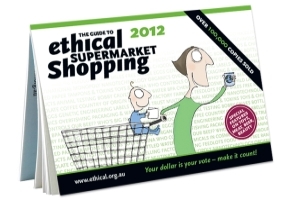 So I went on line at www.bananablue.com.au and with my Ethical Shopping Guide I ordered on line for products purchased at Foodland and delivered by BananaBlue. Of course I pay a delivery fee but I reckoned that if I buy enough for a month I am only paying about about $2.50 a week for the delivery. That works well as I am still buying my fruit and veg at the local fruiterer who faithfully marks everything with Adelaide Hills, Adelaide Plains and South Australia and similarly the local Health Food Shop and delicatessen who are willing to label or tell me where things come from. It is good to have found a way to avoid those two big monsters.